Our SPREADER STICKER with its proprietary enzyme base helps make plants more receptive to pesticides. SPREADER STICKER is a general purpose surfactant for ground applied herbicides, fungicides and fertilizers. Its surfactants help it stick to the leaves and its wetting agents penetrate the soil taking the chemical to the roots. Due to its superior qualities as a sticker, many growers have reduced the number of sprayings required during a season for pest control, saving chemical and application dollars. 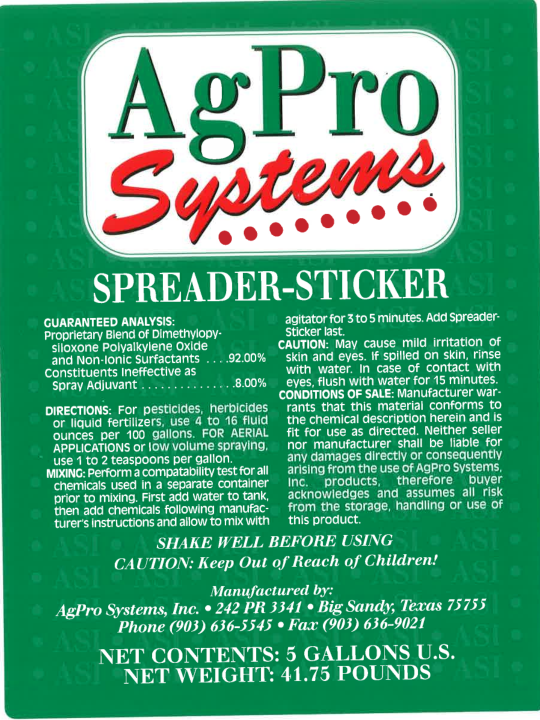 AgPro™ SPREADER STICKER is a unique and superior non-ionic surfactant and sticker, effective in pesticide application. It ensures complete coverage. Growers and golf courses also use it as a soil penetrant because of its soil stimulant qualities. AgPro™ SPREADER STICKER is recommended for use with non-selective herbicides and other pesticides including those used to desiccate or defoliate. Some pesticides may require higher or lower spreader-sticker rates for the desired results. Follow the pesticide label directions. When used as a penetrant SPREADER STICKER can be mixed with most fertilizers and pesticides. Aerial: As a Spreader Sticker: Apply 1 to 2 fl. oz. per 1 gallon of spray. Ground: As a Spreader Sticker: 4 to 10 fl. oz. per 100 gallons of spray. Agricultural Field Crops: As a Soil Penetrant: Apply 16 to 64 fl. oz. per acre. Golf Courses: As a Soil Penetrant: Apply 32 to 64 fl. oz. per acre. Lawns and Turf: As a Soil Penetrant: Apply 32 to 64 fl. oz. per acre. Add Spreader Sticker and mix with normal agitation.